Systemic mastocytosis, often termed systemic mast cell disease (SMCD), is a myeloproliferative neoplasm characterized by infiltration of clonally derived mast cells in different tissues, including bone marrow (see the image below), skin, the gastrointestinal tract, the liver, and the spleen. [1, 2, 3, 4] Median survival ranges from 198 months in patients with indolent systemic mastocytosis to 41 months in aggressive systemic mastocytosis and 2 months in mast cell leukemia. Bone marrow aspirate, Romanowsky stain, high-definition magnification. Diagnosis is mastocytosis, and morphology is abnormal mast cells. This is a bone marrow smear from a patient with systemic mastocytosis. Several mast cells are present in this photograph. These mast cells are larger than normal mast cells and have more irregularly shaped nuclear outlines and less densely packed mast cell granules. Courtesy of the American Society of Hematology Slide Bank. Used with permission. The major diagnostic criterion for systemic mastocytosis is the presence of dense infiltrates of mast cells in bone marrow or other extracutaneous tissues. Mast cells should be seen in aggregates of 15 or more. Systemic mastocytosis is characterized by mast cell infiltration of extracutaneous organs, which is in contrast to cutaneous mast cell disorders, which involve only the skin. Ehrlich first described mast cells in 1877 when he found cells that stained metachromatically with aniline dyes. He called these cells "mast Zellen" because the cells were distended with granules (ie, the botanical definition of mast, which refers to an accumulation of nuts on the forest floor). Cutaneous mastocytosis was identified in the late 19th century. Sangster first described urticaria pigmentosa, which is one of the cutaneous mast cell disorders, in 1878. In 1933, Touraine suggested that this disease could involve internal organs. In 1949, Ellis first established at autopsy that cutaneous mastocytosis can also involve internal organs. An autopsy of a 1-year-old infant revealed mast cell infiltration of the bone marrow, lymph nodes, spleen, kidneys, and pancreas. For patient education information, see the Allergies Center, as well as Allergic Reaction and Severe Allergic Reaction (Anaphylactic Shock). Systemic mastocytosis (systemic mast cell disease) is characterized by mast cell infiltration of extracutaneous organs. Mast cells typically infiltrate the bone marrow and consequently affect the peripheral blood and coagulation system. Mast cells are derived from CD34+/ KIT+ pluripotent hematopoietic cells in the bone marrow. The neoplastic clone of mast cells express abnormal cell surface markers CD25 and/or CD2. The marrow cellularity ranges from normocellular to markedly hypercellular changes. Erythropoiesis is usually normoblastic without any significant abnormalities. Eosinophilia is a common bone marrow histology finding (see Workup, Histologic Findings). Hypocellular bone marrow and myelofibrosis can be observed in late stages of systemic mastocytosis (systemic mast cell disease). Focal mast cell lesions in the bone marrow are found in approximately 90% of adult patients with systemic mastocytosis. A typical mast cell has a spindle-shaped nucleus and fine eosinophilic granules, which can be visualized at high magnification. These cells are likely to return positive findings upon Giemsa staining. Peripheral blood can show anemia, leukopenia, thrombocytopenia, and lymphopenia. The most common abnormality found in the peripheral blood is anemia. 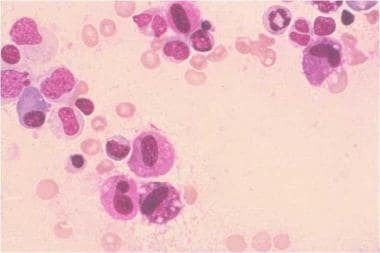 In some patients, eosinophilia, leukocytosis, basophilia, thrombocytosis, and monocytosis can be observed. Spleen and lymphoid tissue involvement is a significant manifestation of systemic mastocytosis. Mast cell infiltrates in the spleen can cause nodular areas that could be confused with lymphomas. A biopsy specimen from the spleen can reveal findings similar to a myeloproliferative disorder or hairy cell leukemia. Histopathology studies of the spleen can reveal two types of involvement: (1) diffuse infiltration of the red pulp and sinuses and (2) focal infiltration of the white pulp. Lymph node biopsy can show mast cell infiltrates, particularly in the paracortex. Follicles and medullary involvement can be observed in some cases. The immune system is affected as a consequence of the previously mentioned pathology. Mast cell products, such as interleukin 4 (IL-4) and interleukin 3 (IL-3), may induce immunoglobulin E (IgE) synthesis and augment T-cell differentiation toward an allergic phenotype. Mast cells also release histamine, which results in inhibition of interleukin 2 (IL-2). GI involvement includes microscopic infiltration of the liver, pancreas, and intestines by mast cells. [18, 19] Abdominal pain has been attributed to peptic ulcer disease, involvement of the GI tract by mast cells, mediators released by mast cells, and motility disorders. GI involvement includes esophageal involvement (eg, esophagitis, stricture, varices), gastric involvement (eg, peptic ulcer disease, mucosal lesions), small intestine involvement (eg, dilatated small bowel, malabsorption), colon and rectal involvement (eg, multiple polyposis, diverticulitis), and liver involvement (eg, hepatomegaly and portal hypertension, ascites, sclerosing cholangitis, Budd-Chiari syndrome). Systemic mastocytosis is an extremely rare disorder; the specific incidence has not been reported. Epidemiologic data on the incidence of systemic mastocytosis are lacking. Some studies in Great Britain showed two cases per year from a study population of 300,000. Systemic mastocytosis is a progressive neoplastic disorder that has no known curative therapy. Survival in patients with indolent systemic mastocytosis (ISM), with a median survival of 198 months, is not significantly different from the general population. However, median survival with aggressive systemic mastocytosis (ASM) is 41 months and that with SM-AHNMD (associated hematological non– mast cell disorder) is 24 months. Mast cell leukemia (MCL) has the poorest prognosis with a median survival of 2 months. A slight male preponderance in the incidence of mastocytosis is noted. Mastocytosis is more common in children than in adults, and it is usually transient and self-limited in children compared with the adult version. Onset in those younger than 2 years is noted in 55% of patients, and, in an additional 10% of patients, the onset is between the ages of 2 and 15 years. Akin C, Metcalfe DD. Systemic mastocytosis. Annu Rev Med. 2004. 55:419-32. [Medline]. Bain BJ. Systemic mastocytosis and other mast cell neoplasms. Br J Haematol. 1999 Jul. 106(1):9-17. [Medline]. Bunimovich O, Grassi M, Baer MR. Systemic mastocytosis: classification, pathogenesis, diagnosis, and treatment. Cutis. 2009 Jan. 83(1):29-36. [Medline]. Pettigrew HD, Teuber SS, Kong JS, Gershwin ME. Contemporary challenges in mastocytosis. Clin Rev Allergy Immunol. 2010 Apr. 38(2-3):125-34. [Medline]. Bonadonna P, Zanotti R, Pagani M, Caruso B, Perbellini O, Colarossi S. How much specific is the association between hymenoptera venom allergy and mastocytosis?. Allergy. 2009 Sep. 64(9):1379-82. [Medline]. Weingarten TN, Volcheck GW, Sprung J. Anaphylactoid reaction to intravenous contrast in patient with systemic mastocytosis. Anaesth Intensive Care. 2009 Jul. 37(4):646-9. [Medline]. Lim KH, Tefferi A, Lasho TL, et al. Systemic mastocytosis in 342 consecutive adults: survival studies and prognostic factors. Blood. 2009 Jun 4. 113(23):5727-36. [Medline]. Schwartz LB, Irani AM. Serum tryptase and the laboratory diagnosis of systemic mastocytosis. Hematol Oncol Clin North Am. 2000 Jun. 14(3):641-57. [Medline]. Ustun C, Corless CL, Savage N, et al. Chemotherapy and dasatinib induce long-term hematologic and molecular remission in systemic mastocytosis with acute myeloid leukemia with KIT D816V. Leuk Res. 2009 May. 33(5):735-41. [Medline]. Pardanani A, Ketterling RP, Brockman SR, et al. CHIC2 deletion, a surrogate for FIP1L1-PDGFRA fusion, occurs in systemic mastocytosis associated with eosinophilia and predicts response to imatinib mesylate therapy. Blood. 2003 Nov 1. 102(9):3093-6. [Medline]. [Full Text]. Gotlib J, Kluin-Nelemans HC, George TI, Akin C, Sotlar K, Hermine O, et al. Efficacy and Safety of Midostaurin in Advanced Systemic Mastocytosis. N Engl J Med. 2016 Jun 30. 374 (26):2530-41. [Medline]. [Full Text]. Pieri L, Bonadonna P, Elena C, Papayannidis C, Grifoni FI, et al. Clinical presentation and management practice of systemic mastocytosis. A survey on 460 Italian patients. Am J Hematol. 2016 Apr 7. [Medline]. Ehrlich P. Beitrage zur Kenntnis der Anilinfarbungen und ihrer Verwendung in der mikroskopischen Technik. Arch mikr Anat. 1877. 13:263-7. Parker RI. Hematologic aspects of systemic mastocytosis. Hematol Oncol Clin North Am. 2000 Jun. 14(3):557-68. [Medline]. Kirshenbaum AS, Goff JP, Semere T, Foster B, Scott LM, Metcalfe DD. Demonstration that human mast cells arise from a progenitor cell population that is CD34(+), c-kit(+), and expresses aminopeptidase N (CD13). Blood. 1999 Oct 1. 94(7):2333-42. [Medline]. Mueller N, Wicklein D, Eisenwort G, Jawhar M, Berger D, Stefanzl G, et al. CD44 is a RAS/STAT5-regulated invasion receptor that triggers disease expansion in advanced mastocytosis. Blood. 2018 Jul 17. [Medline]. Ho CL, Kito H, Squillace DL, Lasho TL, Tefferi A. Clinical correlates of serum pro-major basic protein in a spectrum of eosinophilic disorders and myelofibrosis. Acta Haematol. 2008. 120(3):158-64. [Medline]. Jensen RT. Gastrointestinal abnormalities and involvement in systemic mastocytosis. Hematol Oncol Clin North Am. 2000 Jun. 14(3):579-623. [Medline]. Rossini M, Zanotti R, Orsolini G, Tripi G, Viapiana O, Idolazzi L, et al. Prevalence, pathogenesis, and treatment options for mastocytosis-related osteoporosis. Osteoporos Int. 2016 Feb 18. [Medline]. [Guideline] Arber DA, Orazi A, Hasserjian R, Thiele J, Borowitz MJ, Le Beau MM, et al. The 2016 revision to the World Health Organization classification of myeloid neoplasms and acute leukemia. Blood. 2016 May 19. 127 (20):2391-405. [Medline]. [Full Text]. Tefferi A, Levine RL, Lim KH, Abdel-Wahab O, Lasho TL, Patel J, et al. Frequent TET2 mutations in systemic mastocytosis: clinical, KITD816V and FIP1L1-PDGFRA correlates. Leukemia. 2009 May. 23(5):900-4. [Medline]. Butterfield JH. Survey of aspirin administration in systemic mastocytosis. Prostaglandins Other Lipid Mediat. 2009 Apr. 88(3-4):122-4. [Medline]. Mital A, Prejzner W, Hellmann A. Acquired von Willebrand syndrome during the course of systemic mastocytosis - analysis of 21 cases. Pol Arch Intern Med. 2018 Jul 11. [Medline]. [Full Text]. Ma Y, Zeng S, Metcalfe DD, et al. The c-KIT mutation causing human mastocytosis is resistant to STI571 and other KIT kinase inhibitors; kinases with enzymatic site mutations show different inhibitor sensitivity profiles than wild-type kinases and those with regulatory-type mutations. Blood. 2002 Mar 1. 99(5):1741-4. [Medline]. [Full Text]. Pardanani A, Elliott M, Reeder T, et al. Imatinib for systemic mast-cell disease. Lancet. 2003 Aug 16. 362(9383):535-6. [Medline]. Garcia-Montero AC, Jara-Acevedo M, Teodosio C, Sanchez ML, Nunez R, Prados A, et al. KIT mutation in mast cells and other bone marrow hematopoietic cell lineages in systemic mast cell disorders: a prospective study of the Spanish Network on Mastocytosis (REMA) in a series of 113 patients. Blood. 2006 Oct 1. 108(7):2366-72. [Medline]. Jawhar M, Schwaab J, Horny HP, Sotlar K, Naumann N, Fabarius A, et al. Impact of Centralized Evaluation of Bone Marrow Histology in Systemic Mastocytosis. Eur J Clin Invest. 2016 Feb 23. [Medline]. Lueke AJ, Meeusen JW, Donato LJ, Gray AV, Butterfield JH, Saenger AK. Analytical and clinical validation of an LC-MS/MS method for urine leukotriene E4: A marker of systemic mastocytosis. Clin Biochem. 2016 Feb 18. 264 (1):217-22. [Medline]. Horny HP. Mastocytosis: an unusual clonal disorder of bone marrow-derived hematopoietic progenitor cells. Am J Clin Pathol. 2009 Sep. 132(3):438-47. [Medline]. Metcalfe DD. Classification and diagnosis of mastocytosis: current status. J Invest Dermatol. 1991 Mar. 96(3 suppl):2S-4S; discussion 4S, 60S-65S. [Medline]. [Full Text]. Worobec AS. Treatment of systemic mast cell disorders. Hematol Oncol Clin North Am. 2000 Jun. 14(3):659-87, vii. [Medline]. van der Veer E, van der Goot W, de Monchy JG, Kluin-Nelemans HC, van Doormaal JJ. High prevalence of fractures and osteoporosis in patients with indolent systemic mastocytosis. Allergy. 2012 Mar. 67(3):431-8. [Medline]. Aichberger KJ, Sperr WR, Gleixner KV, Kretschmer A, Valent P. Treatment responses to cladribine and dasatinib in rapidly progressing aggressive mastocytosis. Eur J Clin Invest. 2008 Nov. 38(11):869-73. [Medline]. Dowse R, Ibrahim M, McLornan DP, Moonim MT, Harrison CN, Radia DH. Beneficial effects of JAK inhibitor therapy in Systemic Mastocytosis. Br J Haematol. 2016 Feb 5. [Medline]. [Full Text]. Chaar CI, Bell RL, Duffy TP, Duffy AJ. Guidelines for safe surgery in patients with systemic mastocytosis. Am Surg. 2009 Jan. 75(1):74-80. [Medline]. Vega-Ruiz A, Cortes JE, Sever M, et al. Phase II study of imatinib mesylate as therapy for patients with systemic mastocytosis. Leuk Res. 2009 Nov. 33(11):1481-4. [Medline]. Yacoub A, Prochaska L. Ruxolitinib improves symptoms and quality of life in a patient with systemic mastocytosis. Biomark Res. 2016. 4:2. [Medline]. [Full Text]. Pardanani A, Lim KH, Lasho TL, et al. Prognostically relevant breakdown of 123 patients with systemic mastocytosis associated with other myeloid malignancies. Blood. 2009 Oct 29. 114(18):3769-72. [Medline]. Akin C, Schwartz LB, Kitoh T, et al. Soluble stem cell factor receptor (CD117) and IL-2 receptor alpha chain (CD25) levels in the plasma of patients with mastocytosis: relationships to disease severity and bone marrow pathology. Blood. 2000 Aug 15. 96(4):1267-73. [Medline]. [Full Text]. Kumar S, Moody P. Mastocytosis. Pediatr Rev. 2001 Jan. 22(1):33-4. [Medline]. Longley BJ, Metcalfe DD. A proposed classification of mastocytosis incorporating molecular genetics. Hematol Oncol Clin North Am. 2000 Jun. 14(3):697-701, viii. [Medline]. Pauls JD, Brems J, Pockros PJ, et al. Mastocytosis: diverse presentations and outcomes. Arch Intern Med. 1999 Feb 22. 159(4):401-5. [Medline]. Seitz S, Barvencik F, Koehne T, Priemel M, Pogoda P, Semler J, et al. Increased osteoblast and osteoclast indices in individuals with systemic mastocytosis. Osteoporos Int. 2013 Feb 23. [Medline]. Soter NA. Mastocytosis and the skin. Hematol Oncol Clin North Am. 2000 Jun. 14(3):537-55, vi. [Medline]. Sperr WR, El-Samahi A, Kundi M, Girschikofsky M, Winkler S, Lutz D. Elevated tryptase levels selectively cluster in myeloid neoplasms: a novel diagnostic approach and screen marker in clinical haematology. Eur J Clin Invest. 2009 Oct. 39(10):914-23. [Medline]. Swolin B, Rodjer S, Roupe G. Cytogenetic studies in patients with mastocytosis. Cancer Genet Cytogenet. 2000 Jul 15. 120(2):131-5. [Medline]. Tefferi A, Li CY, Butterfield JH, Hoagland HC. Treatment of systemic mast-cell disease with cladribine. N Engl J Med. 2001 Jan 25. 344(4):307-9. [Medline]. van Daele PL, Beukenkamp BS, Geertsma-Kleinekoort WM, et al. Immunophenotyping of mast cells: a sensitive and specific diagnostic tool for systemic mastocytosis. Neth J Med. 2009 Apr. 67(4):142-6. [Medline]. Bone marrow aspirate, toluidine stain, low magnification. Diagnosis is mastocytosis, and morphology is abnormal mast cells. This is a toluidine blue stain of a bone marrow smear from a patient with marrow involvement by systemic mastocytosis. Five mast cells are present in this field. The mast cell granules are metachromatic with the toluidine blue reaction. Courtesy of the American Society of Hematology Slide Bank. Used with permission. Bone marrow biopsy, toluidine stain, low magnification. Diagnosis is mastocytosis, and morphology is abnormal mast cell infiltrate. This is a toluidine blue stain of a bone marrow biopsy from a patient with systemic mastocytosis. The mast cells are metachromatic with toluidine blue and contain numerous purple granules. Courtesy of the American Society of Hematology Slide Bank. Used with permission. Lymph node biopsy. Diagnosis is mastocytosis, morphology is mast cell infiltrate, and the organ is the lymph nodes. This is a lymph node biopsy from a person with systemic mastocytosis. The mast cells have a characteristic perifollicular distribution. Courtesy of the American Society of Hematology Slide Bank. Used with permission. Lymph node biopsy, chloroacetate esterase stain. Diagnosis is mastocytosis, and morphology is mast cell infiltrate. This is a portion of a lymph node biopsy from a patient with systemic mastocytosis. The mast cells are chloroacetate esterase positive, which is characterized by an orange granular appearance. Courtesy of the American Society of Hematology Slide Bank. Used with permission. The authors and editors of Medscape Reference gratefully acknowledge the contributions of previous authors Stephen J Smith, MD, Harsha G Vardhana, MD, and Guha Krishnaswamy, MD, to the development and writing of this article.